PT Toyota Motor Manufacturing Indonesia - TMMIN is a reputable foreign investment company (PMA) in Indonesia, running business in automotive industry. Based in Jakarta, TMMIN operates primarily as manufacturer and exporter of Toyota vehicle and its components. 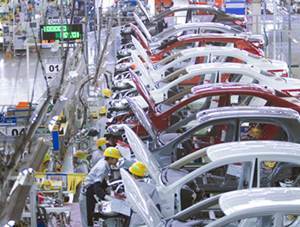 TMMIN is recognized as the largest car manufacturers in Indonesia with total production capacity of 250,000 units of vehicles and 195,000 engines per year. TMMIN is a multinational joint vetunre company between Japan Toyota Motor Corporation (TMC) and Indonesia PT Astra International Tbk (Astra Group). TMC, which owns 95% of TMMIN’s issued share capital, is one of the largest automotive companies from Japan. Astra Group owns 5% of TMMIN's issued share capital and is one of the largest business conglomerates in Indonesia with strong business interest on automotive industry. According to TMMIN's company profile as cited by JobsCDC.com, TMMIN runs its business through 5 production facilities; Plant 1 Karawang (production line up : Kijang Innova and Fortuner), Plant 2 Karawang (production line up : Etios Valco, Yaris, and Vios), New Engine Plant Kawarang (production line up : standard passenger car engines), Plant 1 Sunter Jakarta (engine assy), and Plant 2 Sunter Jakarta (packing center). UNIVERSITY GRADUATE, majoring from Mechanical, Industrial, Electrical, Computer Science, Civil, Chemical, Metallurgy, Economics, Business Management, Law, Psychology, and International Relation. ACADEMY GRADUATE, majoring from Mechanical, Manufacture, Electrical, Management Information, Civil, and Administration. Have an outstanding academic record with GPA > 3.00 (scale of 4.00). University graduate : maximum age of 27 years old. Academy graduate : maximum age of 25 years old. JobsCDC.com now available on android device. Download now on Google Play here. Please be aware of recruitment fraud. The entire stage of this selection process is free of charge. PT Toyota Motor Manufacturing Indonesia - D3, S1 Fresh Graduate NEDP TMMIN May 2017 will never ask for fees or upfront payments for any purposes during the recruitment process such as transportation and accommodation.